In this document you will find all the information for the toprope course. During the toprope course every new member will be taught a number of things. Firstly, you will be made familiar with the type of climbing material we use. Secondly, you will learn how to properly tie in so you can climb safely and how to check each other. Finally, you will learn how to safely belay a toproper. Besides that, you will also be made familiar with the most important rules and regulations regarding climbing at the TSAC. In total, the toprope course will take up three evenings. On the final evening there will be an examination. Furthermore, you have to be familiar with the theory and with the regulations at the TSAC. Aside from the theory in the NKBV‑booklet (Dutch) further on in this document, the TSAC has specific regulations regarding his own climbing walls. 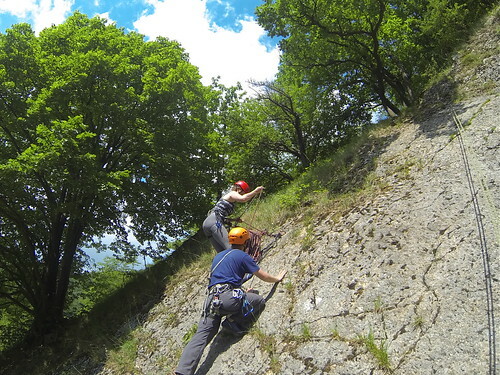 At TSAC we follow the course information of the national climbing association (NKBV). Since it is in Dutch we have translated the most important parts for you below. There are two different ways to tie in; ‘direct’ with a figure-eight-follow-through knot (see Figure 1) and ‘indirect’ with karabiners. ‘Indirect’ can be done with one safebiner or two opposite locking karabiners. Never tie in on your gear loops, these can’t hold more than 10 kilograms! The harness is properly secured. The belay device is correctly installed. The karabiner for the belay device is screwed tight. The end of the rope is tied of. The climber is tied in correctly. Remember that in the climbing world we also rely on social control, if you see somebody making a mistake you point it out or notify the attendant. Also accept it if somebody points out your mistakes. You move one hand to the climbing end of the rope. You take in the rope by pulling on the climbing end and moving the belay end up. You pull down the belaying end. You move your first hand back to the belaying end. You move your second hand above your first hand (=0). It is better to take in small amounts of rope and repeat the steps more frequently than to take in large amounts of rope as it reduced the fall distance. Be careful not to have excessive slack in the rope. The weight difference between the climber and the belayer shouldn’t be more than 30%. The TSAC is fortunate to have access to four beautiful climbing walls at the sport centre, allowing you – after passing your toprope exam – to climb to your heart’s content. Each wall has its own rules regarding its use, all of which are described in the relevant wall regulations. Of course you can always just ask somebody about the rules. To prevent injuries, remove all types of jewellery and accessories etc. before you start climbing. Never put your fingers through the metal bolt hangers (short: bolts) or in the holes of the brick walls! If you fall, there is a chance that you will lose your fingers. The bolts are meant to be used for hanging in quickdraws during lead climbing and should not be used for pulling yourself up or to stand on. If you want some aid, hang a quickdraw or a sling in the bolt and grab the webbing to pull yourself up, don’t use karabiners or other metal objects. There is a metal ladder on the right side of the concrete wall. You can use it to easily reach the top of the wall to, for example, hang out a toprope. Caution, don't fall down! Also, you can easily bump your head. There are several fixed abseil ropes for the concrete wall. These are meant to be used specifically for abseiling so that regular ropes wear less quickly. Therefore, try to use these ropes or the metal ladder to get down if you are not in a toprope. Always tie in using a figure 8 follow‑through knot. The slabs in front of the ventilation shafts on the concrete wall are not secured. Don’t touch them! When you start a toprope in the middle section of the plastic wall, make sure the last three quickdraws in the ceiling are clipped in. If you are climbing in the ceiling and your feet are no longer on the vertical wall, you have to unclip the quickdraw in the corner. Remember to clip it back in before going down. When bouldering on the concrete wall you are not allowed to place your feet above the first horizontal seam. Never stand on the rope. Small rocks or grains of sand can get through the sheath and damage the core. Incidentally, any inconsistencies in or damage to the rope should be reported immediately to the supervising instructor. To prevent the rope from getting tangled up (very inconvenient during climbing!) the rope has to be coiled neatly after use. There are several ways to coil your rope but the TSAC uses the French method (i.e. butterfly coil tied off with a gasket hitch). Make sure you tie the hitch firmly so that the coil will not fall apart. If everybody pays attention to coiling the rope properly, you can always grab a rope from the shelf, tie in and start climbing immediately. It’s just annoying if you have to flake the rope before you can start climbing. Finally, during the regular climbing evenings there is always 1 supervising instructor tasked with guarding everybody’s safety: the attendant (Dutch: "zaalwacht"). Any command from him/her needs to be obeyed. Should you ever break one of these rules and the attendant catches you, you will have to buy him/her a drink in the canteen!